While some of us have already succumbed to that sweater-weather bod, others of us are trying, as best we can, to keep those inevitable and fast-approaching holiday LB's from creeping up on us. Given Chicago’s love affair with hot dogs, pizza, Italian beef sandwiches, and brunch, it’s not always easy to stay svelte when dining out in the city. From a fast-expanding poke concept to a Peruvian favorite, here are seven places where eating healthy is easy, accessible, and genuinely delicious. 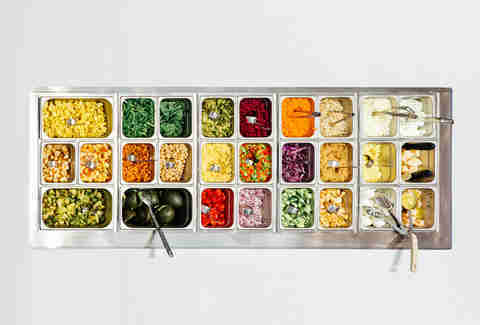 Take what you know about salad-focused eateries and strike it -- this DC-based chain may serve calorie-conscious eats, but it’s anything but boring. If you’re staying the greens route, try the 440-calorie spicy sabzi, which features organic baby spinach and shredded kale tossed with roasted sesame tofu, spicy broccoli, raw beets, organic carrots, spicy quinoa, bean sprouts, basil, red chili, and a carrot-chili vinaigrette. Or, if you’re craving something hearty, try the guilt-free harvest bowl with organic wild rice, shredded kale, apples, sweet potatoes, roasted chicken, local goat cheese, toasted almonds, and balsamic vinaigrette. The Mediterranean Diet exists for a reason, people: it’s an effective weight-loss plan (allegedly), and it tastes delicious. 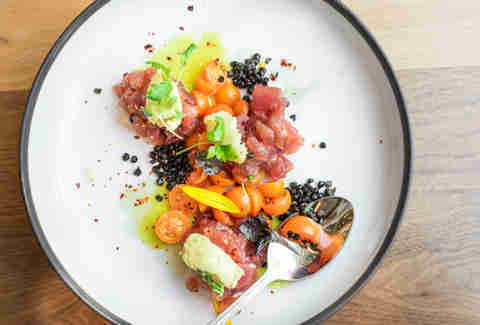 No, chef CJ Jacobson’s (former chef-in-residence at Intro) California-influenced Mediterranean concept isn’t a poster child for the popular diet, but it does spotlight cheffy-yet-healthful preparations of diet-approved dishes that deliver big on flavor. Explore spreads like spicy hummus blended with marinated fresno and sweet-roasted chilies, avocado and sweet pea, and toasted almond and garlic, a variety of greens and ancient grains-based dishes, tuna crudo that’s as pretty as it is delicious, and grilled chicken kebabs. End your meal with frozen Greek yogurt drizzled with California olive oil and sprinkled with sea salt. 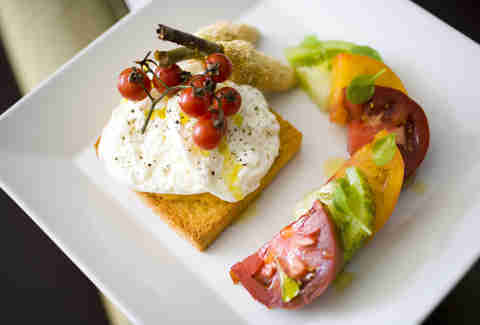 Whether you’re a longtime vegetarian or just trying it out for one meal just to see how it feels, this vegetarian-friendly spot is great for an upscale dining experience that won’t damage your waistline. The current five-course chef’s tasting menu includes blistered shishito peppers with tatsoi, scallion greens, kochukaru, and Chinese mustard vinaigrette, squash risotto “beggars purse,” and an orange chiffon cake made complemented by blueberry frozen yogurt, hazelnut streusel, orange caramel, and whipped goat cheese. OK, we’ll concede that this Peruvian resto isn’t exactly marketed as a “healthy restaurant,” but it’s so easy to eat healthy here that we’d be remiss to not include it. 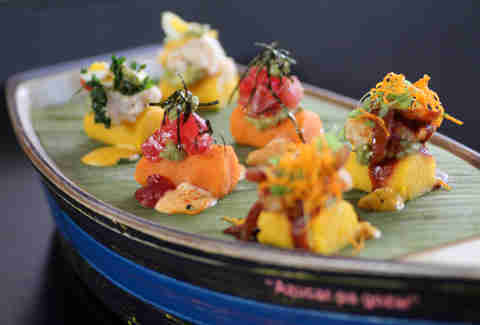 To eat light without feeling like you’re sacrificing anything, try the ahi tuna tiradito with passion fruit leche de tigre, honey, and sesame oil emulsion, octopus skewers with chimichurri, crispy garlic, and olive sauce, cebiches, quinoa salad, and grilled duck breast with huancaina, cilantro rice, and avocado-radish salad. 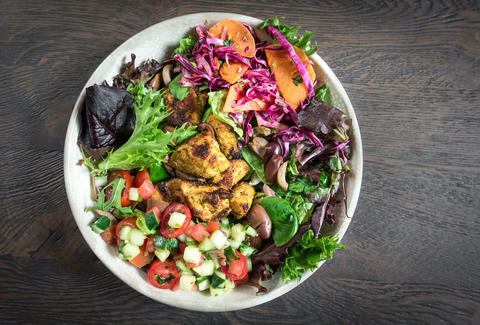 Few places are easier to eat healthy on the go than this rapidly expanding fast-casual chain, where customizable Mediterranean fare is the name of the game. 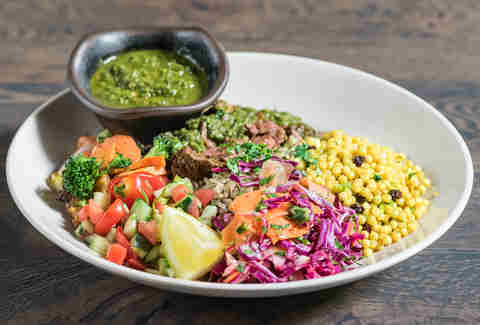 Load up a salad with veggies, healthy grains like couscous and quinoa, and chicken roti, and team it with tahini and falafel made with organic chickpeas on the side. Once you get past the excessively hipster ring to “chef-driven juice apothecary,” this unique establishment is actually a health nut’s dream-come-true. Choose from a selection of juices, ranging from greens-based and root-based to fruity, nutty, and savory. If liquid meals aren’t your thing, check out the cashew yogurt bowl with coconut milk, banana, chia seeds, orange and grapefruit supremes, and sesame brittle, or the sweet potato noodle salad with homemade kimchi, fried almond, grapes, cilantro, and a lime wedge.